Coin grading is a very controversial subject in the Numismatics industry as it is very subjective. Yet, the grade of the coin dictates its price. And sometimes, there can be a large jump in price depending on if the coin grades MS-64 or MS-65. How can you protect yourself from buying an overgraded or problem coin? This is something that most collectors are concerned with. 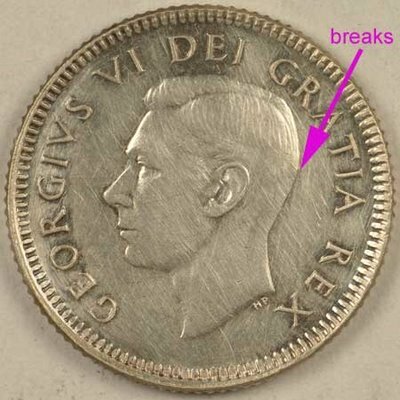 While you can spend hours studying volumes of information on coin grading, I’ve tried to compile a list of ten coin grading tips that should help you in three areas that I’ve seen most collectors struggle: grading Mint State (Uncirculated) coins, determining whether a coin is AU (Almost Uncirculated) or Mint State, and detecting problems such as cleaning. Before we used numerical grades, we used the following terms. These terms are still used, though quite liberally so their definitions should be taken with a grain of salt. The point of this is to use them to help you determine if a Mint State Coin is roughly fits into one of these categories. By doing this, you will begin to understand if a Mint State coin you are grading is in the ballpark of a low-end or high-end Mint State coin. UNC (Uncirculated) – MS-60 through MS-62. Think of these as below average with lots of contact marks, weak strikes, severely impaired luster, etc. A coin that looks like it is below average for most Mint State coins you see will likely fall into this grade range. BU (Brilliant Uncirculated) – MS-63 and MS-64. Think of MS-63 as an average looking coin, good but not great. MS-64 is a borderline gem coin, one that is nice, maybe slightly above average but you can’t quite call it a “gem”. GEM BU – MS-65 through MS-70. Ask yourself is this coin a “gem”. Really think about that word – a gem is highly prized. It should of course meet the technical criteria for luster, strike and contact marks but does it also have that wow factor? When you see a coin in this grade range, you really should react when seeing by saying “wow, that is a really nice coin.” If you find yourself saying “wow, this is almost a gem” then you are probably at MS-64. Recognizing the difference between 65, 66, 67, 68, etc. 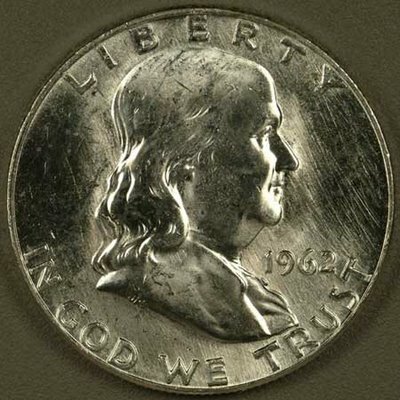 is an art in itself but if you can recognize that a coin is a gem and worth at least a MS-65 price, then you will be ahead of most shoppers out there. 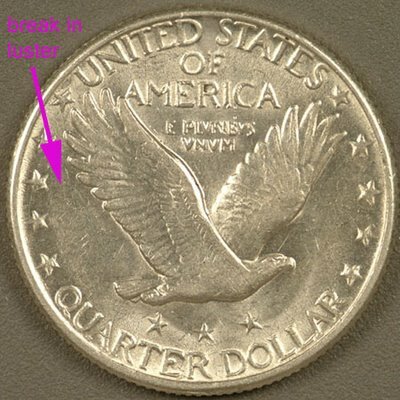 An NGC grader that taught my Advanced Coin Grading class uses the following technique – when you first look at the coin, think of 3 grades and then hone in on the final grade. For example, you may immediately think of 63, 64 and 65. When looking at the coin you may determine that it is almost, but not quite a gem but a little better than average and therefore grade it MS-64. Another technique is tto start at MS-70 and work backwards, asking why not 70, 69, 68, etc until you arrive at a final grade. The point is to develop a technique that helps you arrive at a somewhat accurate grade. Recommended magnification is typically 3x to 7x. Using high-powered loupes (10x to 20x) can make small contact marks look like gigantic canyons. This is also relative – a 7x loupe may be too much for a Morgan dollar. Look at the coin without a loupe first. If necessary, use a loupe but don’t spend too much time with it, as you may be too tough on the coin (a common problem). End your coin grading session with another look at the coin to remind you of that overall impression. The law of averages applies here, as some grade high and some low. With a large enough sampling, the group average should be fairly accurate. The goal here is to become consistent with your coin grading and to learn where you are relative to the market. Try to look at a lot of coins and grade. It’s great if you can do this with slabbed NGC &amp; PCGS coins. If you are a member of the ANA, plan a trip to Colorado Springs, Colorado where you can visit the ANA headquarters and borrow their coin grading set. You can also pull out your own collections and grade them all, or go to local auctions. You won’t be able to verify where you are at relative to NGC and PCGS, but you will at least develop a relative scale from one coin to the next. Then next time you are at a coin show try verifying your skills with slabbed coins. 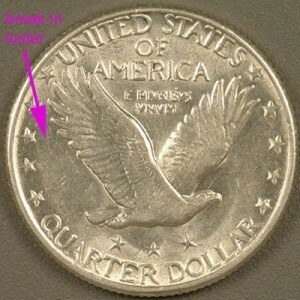 High AU coins may look uncirculated and may slide in to MS-61 holders (hence the term “slider”). The key in determining whether a coin has circulated is to find a break in the luster. The flow lines in the field are typically the first to wear and will cause a break in the luster. Look at the coin under a single-point source, preferably incandescent, light and rotate it to observe the luster. Good luster will appear in the shape of an hourglass and will sping as you rotate it, which is known as the “cartwheel effect”. The luster should be continuous from the center of the coin outward to the edge. If there is a break where there is no luster in the field, that is wear. 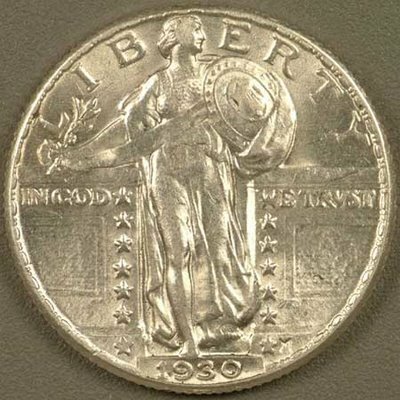 Note the following example where the obverse has full luster but the reverse shows a slight break in luster. Look for the flatness in the area in question. Weak strikes will still have roundness, just not as much. There is often a different color with wear, as well – steel grey for silver and sometimes a different (darker) tone for copper. Hairlines due to cleaning are incuse (into the coin). As a result, light may only reflect from a single angle or a limited number of angles. Therefore, they may not be easily seen at the most common viewing angles. 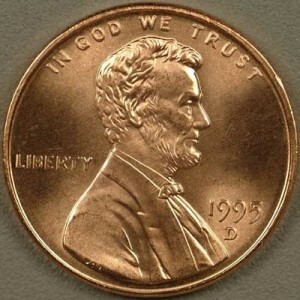 When viewing the coin, rotate in the usual fashion to look at the luster. Then, begin tilting at all different angles, even close to 90 degrees. You will be amazed at what problems may show up such as cleaning hairlines. This also means that the cleaning may not show up in a photograph so you must trust a seller on the internet. This is why shopping at online auctions can be dangerous. Be sure to understand the return policy and consider not participating if there are no returns. It may be better to build a relationship with select sellers with independent web sites. It is also important to note that cleaning lines go over everything – letters, the field and the features. But often, you can spot breaks in the cleaning lines in protected areas which are hard to reach, such as between letters or between the field and features. The following example is a severely cleaned Canadian dime. Note the breaks in the lines between the letters and in front of or behind George’s head. You’ll also see remnants of dark toning in these protected areas. The tarnish is what the person was cleaning. Die polish is often confused with cleaning and is typically easier to see. Die polish in incuse into the die and therefore raised on the coin and easily reflects light at most angles. Die polish is present in the field and will extend up to the lettering and features, but not on to them. Cleaning lines will go over the field, lettering and features. However, there are usually breaks in the lines in the protected areas – hard to reach areas between the field and features, between the field and letters or between letters. Roller Marks are also confused with cleaning as they are incuse lines. These are lines into the planchet that have not been struck out. Therefore, they will extend over the entire coin including the protected areas. Another key difference is that they are typically parallel where cleaning lines may not be. Unless severe, lines resulting from normal minting methods will have little or no affect on the grade of the coin.